Once you have a beautiful deck or patio in place you may find yourself building a patio roof to give yourself a little bit of protection from the elements. Many people enjoy a roof on their patio so that they can enjoy their outdoor space even in inclement weather. Building a patio roof can be simple or elaborate, depending on your design. A basic patio roof style can easily be constructed using a few simple materials. If you are building a patio roof out of wood, you will require strong posts, typically 4" x 4" or 6" x 6", header boards, and cross pieces. The posts should be set into concrete bases for extra stability. If you choose to cover the roof of your patio with plywood sheeting, be sure that you use a high quality wood that will be weather resistant, and make sure that you build the roof with a slope so that rain and snow will run off of the side and not puddle on the roof top. One popular roofing material is a translucent material made of fiberglass which will allow the sunlight to penetrate but will keep rain and heat off of the area. Corrugated fiberglass rooftop material is lightweight and strong and can come in a variety of colors to suit your décor. Another choice for a covering on your patio is to create a pergola. A pergola is an open topped patio cover that utilizes beams and rafters to create an open air roof. This type of design will not protect you from the rain; however it will offer you some shade and sun protection. And for an even more attractive look, you can grow vines or climbing flowers up the sides. 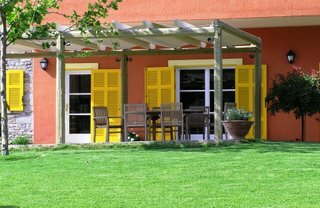 A Pergola is quite simple to construct, and the construction is similar to building a patio roof except you do not put a covering over it. To style the edges of the planks you can cut them on an angle or use a skill saw to create a curvy style. Before you construct either a patio roof or a pergola it is a good idea to check the local bylaws in your area to see if you need a building permit or not. You also may need to have the building designs approved before you are able to start building. Going through this simple step is a good idea, because if you go ahead without approval, you may have to take down your project at a later date if it does not meet the city inspection standards.